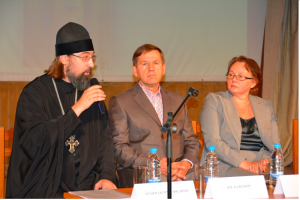 On 13 October 2013, with the blessing of His Holiness Patriarch Kirill of Moscow and All Russia and His Holiness Patriarch Neophyte of Bulgaria, a conference dedicated to the 700th anniversary of the birth of St Sergius of Radonezh was held at the Russian Cultural and Information Centre in Sofia. The Conference is organized by the Metochion of the Russian Orthodox Church in Sofia with the assistance of the Russian Cultural and Information Centre. Archimandrite Filipp (Vasiltsev), rector of the Russian Orthodox Church’s Metochion in Sofia, addressed all those present, noting in his speech the importance of the spiritual heritage of St Sergius of Radonezh for the development of fraternal relations between the Russian and Bulgarian Orthodox Churches, as well as between the people living under spiritual guidance of these Churches. Mr. Andrei Khoshev, a staff member of the DECR Secretariat for Inter-Orthodox Relations, read out the message of greetings from Metropolitan Hilarion of Volokolamsk, chairman of the Moscow Patriarchate’s Department for External Church Relations, addressed to the organizers, participants and guests of the conference, website of the Russian Orthodox Church’s Metochion in Sofia reports. Mr. Sergei Kravets, head of the Orthodox Encyclopedia church research centre, and Mrs. Elena Kravets, managing editor of the ‘History of the Russian Orthodox Church’ section of the Orthodox Encyclopedia, told the participants about the projects launched on the occasion of the 700th anniversary of the birth of this great Russian saint. A report on the history of the cantatory art of the Russian Orthodox Church was delivered by archpriest Kirill Popov, precentor of Sofia priests’ choir. Archpriest Pavel Velikanov, associate professor of the Moscow Theological Academy, spoke about the life of the Laura of the Holy Trinity and St Sergius and about the activities of the Moscow Theological Schools located in the territory of the Laura. Present at the conference were Mr. Viktor Bazhenov, head of the representation of the Rossotrudnichestvo in Bulgaria, as well as the Russian and Bulgarian cultural figures and parishioners of the Russian Orthodox Metochion in Sofia.